1) The vast majority of title loans in Illinois are taken out by low-income people. 2) The number of title loans issued in Illinois has steadily increased between 2009 and 2013. 3) The annual percentage rate (APR) charged by lenders has decreased slightly, but the average term, principal amount, and total fees have increased significantly. 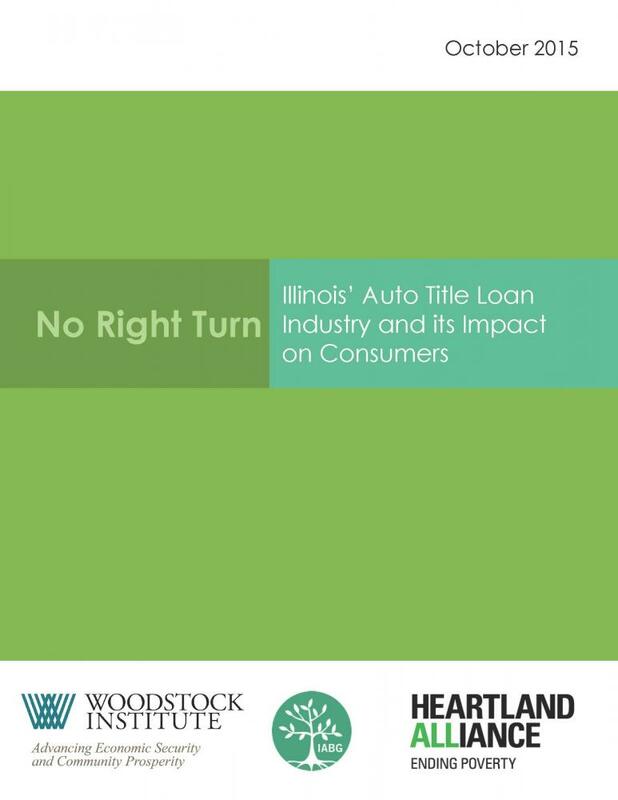 4) Illinois title lenders made loans to consumers in other states where title loans are illegal. 1) The Consumer Financial Protection Bureau (CFPB) should issue strong rules covering high-cost, small-dollar loans, including title loans, to ensure loans are safe and affordable. 2) Congress should pass legislation instituting a 36 percent cap for all consumer loan products, including title loans. 3) The Illinois legislature should strengthen the Consumer Installment Loan Act to require stronger ability-to-repay standards, maximum loan terms, and a rate cap of 36 percent APR. 4) The Illinois Department of Financial and Professional Regulation (IDFPR) should publicly release loan-level data from the state database to allow for a more detailed analysis and monitoring of small-dollar lending in Illinois. 5) Financial Institutions should create and market affordable, small-dollar loans with ability-to-repay standards as alternatives to high-cost, predatory products.